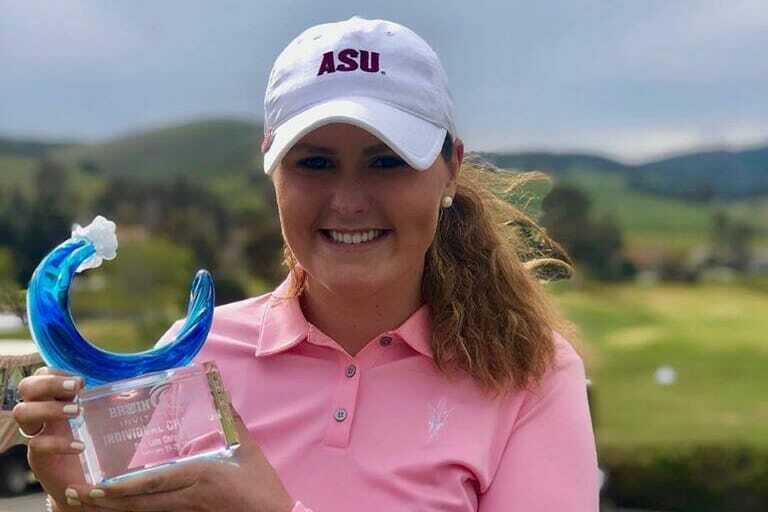 Ireland’s Olivia Mehaffey added to her impressive CV with her first win of the season for Arizona State as she topped the charts at the Bruin Wave International at San Obispo Country Club, CA. Mehaffey held a spot in the top-five after two rounds and played her way up the leaderboard on Tuesday to take the individual victory, besting the second-place finisher from Oregon by one shot (220/+4) while her No. 17 Sun Devil women’s golf team finished top-three in the team standings. Freshman Alexandra Försterling also earned her first collegiate top-10 finish, moving up 13 spots on the final day for an eighth-place finish. Raquel Olmos had her best finish of the spring (T18) while Alessandra Fanali had the best finish of her yet short collegiate career (T29). Madison Kerley (T45) moved up four spots in the third round to complete the Sun Devils’ competing five. ASU finished ahead of several over Pac-12 schools in No. 4 UCLA, No. 28 Washington, and Cal and the entire top-three came from the best conference in collegiate women’s golf. The Sun Devils have found success at this tournament, finishing top-three in all three appearances, also in 2010 and 2016.